By Beau Wilson, Boulder Daily Camera | Boulder’s Office of Arts and Culture is gathering local muralists for their 2019 mural artist roster, which will help the city select artists for enriching Boulder with public art projects. Experienced artists from the Front Range region of Colorado to Wyoming are welcome to submit their applications until April 15. All mediums of art are eligible, and public art experience is not mandatory. Prior contributors to the aural artist roster are welcome to reapply. For more information and visuals of past roster contributors visit boulderarts.org/mural-artist-roster. All applications must be submitted through artist.callforentry.org. 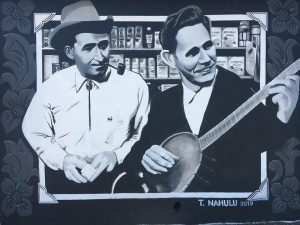 Photo – full description: Mayor of East Tincup, Colorado, Pete Smythe and guitar legend Chet Atkins have returned to their one-time home of West Colfax! This is the finished mural on The Colfax Museum wall, as brilliantly painted by Tommy Kaui Nahulu, assisted by Carmen Richards and Kemery Kane. Drop by and take a look! 6851 W. Colfax Avenue, Lakewood, CO. #LakewoodCO — with Tommy Kaui Nahulu at The Colfax Museum.